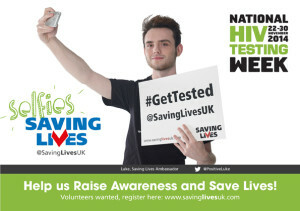 Saving Lives Positive Ambassador Luke was recently diagnosed with HIV – and spoke this morning on Radio 5 Live with a man who was diagnosed in 1982 about the changing perceptions of HIV. Our Medical Director, Dr Steve Taylor, also appeared, discussing the latest HIV figures issued by Public Health England, next week’s National HIV Testing Week – and, of course, Selfies Saving Lives. You can listen to the full interview, which was a companion piece to the station’s lead news story every hour throughout breakfast, below. You can hear more from Luke by visiting his page on our own site here. Previous PostGood Luck, England Ladies!